Who I want to go through marked in bold. Who will likely go through marked in asterisk *. Iceland draw Croatia again. It was Croatia that knocked out Iceland in the 2014 World Cup Playoffs; 4 years later Iceland topped their 2018 World Cup Qualifying Group, relegating Croatia to the play-offs. After noting that the two countries "seem to be a married couple", Iceland head coach Heimir Hallgrimsson said Iceland would demand a divorce from Croatia after next year's World Cup. Nigeria draw Argentina again for the 5th time! (1994, 2002, 2010, 2014 and 2018). Colombia draw Japan again as per 2014, while Brazil get Costa Rica again from 2002. Groups A and H look completely open; while group G should in theory be very easy for England and Belgium.. 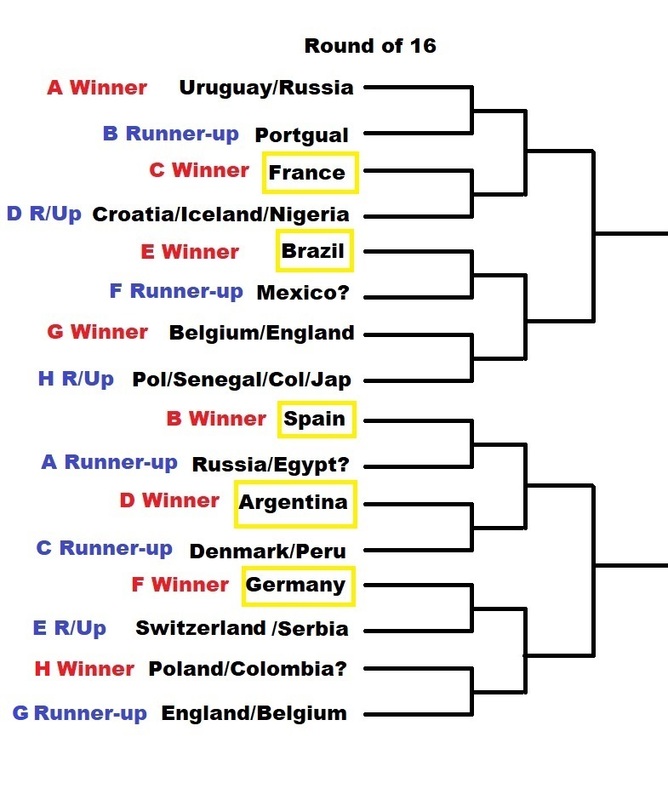 It also means that the teams that progress to the Round of 16 from Groups G and H will avoid heavyweights in that section of the draw (at least until the quarterfinals where Germany and Brazil will likely await). 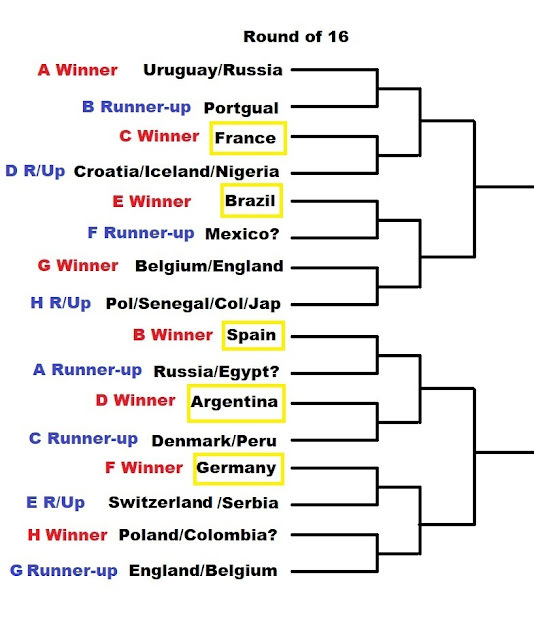 Win the group and get Brazil; come second and get Germany in the QF if all goes to plan (see projected knockout draw below - countries noted in order of likelihood). This is what might happen. Saudi Arabia tops Group A; Egypt comes runner-up. Morrocco tops Group B; Iran comes runner-up. France tops Group C; Aussies come runner-up. Nigeria tops Group D; Iceland comes runner-up. Brazil tops Group E; Switzerland/Serbia come runner-up. South Korea top Group F; Germany come runner-up. Tunisia/Panama top Group G; England are runner-up. Japan top Group H; Senegal come runner-up. Brazil beat Senegal and proceed to top semi. Australia beat Nigeria on penalties and then beat Egypt on penalties. Japan beat England on penalties; South Korea beat Switzerland on penalties. Asia derby between Japan and South Korea. Japan wins 2-1.